What does a good defined benefit transfer file look like? A question that our sister company, Apricity, get asked frequently. So, in light of this together with them, they have put a guide together to make things more clear, naturally with a helping hand from us. 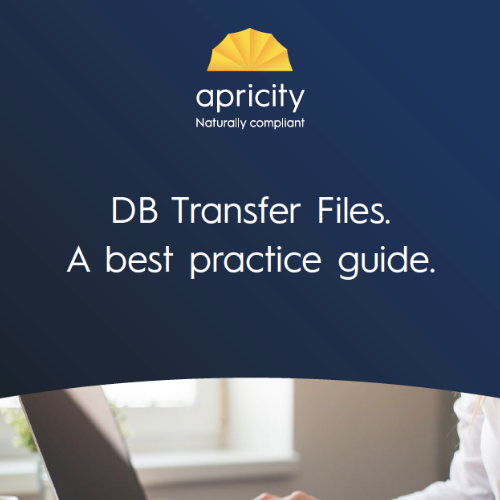 This guide will look at the various components of a file that has recommended a defined benefit transfer, provide some pointers, and talk about what Apricity would expect to see in an “ideal” case. Due to the timeliness of this paper, it also includes an additional element focused on the upcoming changes. It’s important to remember the individuality; of every case, scheme and, of course, client. Any kind of templating or tickbox mentality is unlikely to result in a strong file. Approaching each case with a blank page view is likely to result in a much more compliant case. This paper will provide some context, ideas and guidance in, hopefully, plain English. Apricity undertook a survey to find out the concerns people have in this area, and some of these results are summarised at the end. It has also been aimed to cover specific issues advisers raised when undertaking the survey in here.